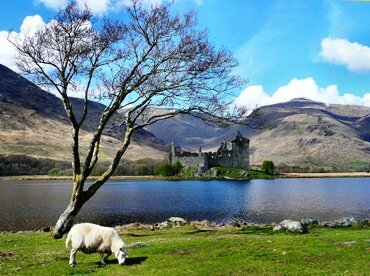 This photo of Kilchurn Castle on Scotland's Loch Awe was taken by "R Q" of Glasgow, Scotland. Showcasing Scotland - the Country - and All Things Scots and Scottish. Find Scots-related Products and Services. Connect and Interact with those who share your interest in Scotland and Scottish Culture. Scotland Magazine: Scotland ... enjoy the dream, explore the land of legends, and experience the reality. Covering all aspects of contemporary Scottish life, as well as the rich tapestry of the country's heritage, you will be amongst the first to discover the trends that will shape the Scotland of tomorrow. Britain Magazine: The official publication of the British Tourist Authority ... serving as an indispensable reference when planning a trip to the United Kingdom, as well as providing spectacular sneak peeks at some of Britain's most beautiful places to visit. Comfi: A Seller - Still one of the Favorites - of Pre-Paid Long Distance Phone Cards and Domestic Phone Minutes. Low rates on International and Domestic Calling. Contiki: One very special niche ... a tour operator for the 18-35 year olds that want to see the world and experience different cultures, but who want to travel safely (especially if traveling solo) and make sure they "see the sights". Average age is about 25. Make new friends, travel, and do a bit of partying while you're at it. Intrepid Travel: A small group tour company with an ethos and modus operandi that might not work for all, but certainly does for some. 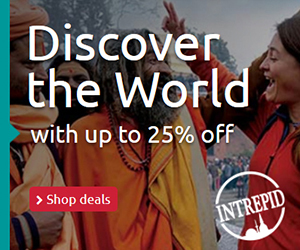 Intrepid specializes in "soft" adventure" travel (which might be a relative term for some folks) and small groups (as few as four and usually not more than 12). It is no frills ... local food, local transport, and modest accommodations ... grassroots travel I guess one would call it. Just without all the pre-planning hassles. They've been doing it since 1989 and have 800 different tour variations. Some folks love 'em (including some of the National Geo folks), some not so much. You just need to know what you're looking for out of your travel experience. One Travel: Offering air, hotel, car, cruise, and travel package deal booking ... considered one of "the top 10" best online travel sites (ranking pretty high on that list ... ahead of others you might hear more about) ... they do have an easy to use site which has lots of info on it which you should read (esp the FAQs) ... also providing good customer support. Rebtel: Cheap & even Free "try-out" International Calling to All Countries ... there are Applications for iPhones, iPads, Androids, Android tablets, Windows Phones & PCs, and a Web-based service for other phones. It is a Long-Time Favorite Among Those Using Pre-Paid Cards. The Android users love it. TopUp.com: A Global MOBILE Recharging Service Where Anyone Can Add Minutes Instantly to Prepaid Mobile Phones from Over 300 Different Carriers in 100+ Countries. No Need to go to the Store and Buy Top Up Cards or Vouchers. If You Run Out of Time, Just Top It Off Here! You can Even Send Airtime and Funds to Friends and Family When They Need It from the Comfort of Your Home or Mobile Device. Pretty Cool.